5th Avenue Goth: Bye, 2016! Hello, 2017! 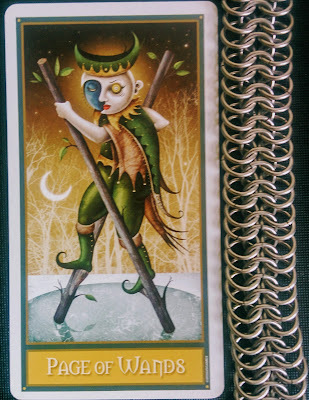 As is the annual tradition of this blog, I'll greet the new year with a tarot card. 2016's card was the 4 of Swords, which is generally associated with stillness and peace. This year was anything but. Some decks also liken it to a tomb, which is more fitting for 2016! 2017's card (above) is the Page of Wands (from the Deviant Moon deck, one of my favorites). It's an optimistic card celebrating human ingenuity and creativity (like how the page crafted stilts to walk across the lake in the illustration). Maybe through engineering and rational thinking, we will find the solutions in 2017. I staged it with a chain mail necklace I made earlier this year, which I think represents a good example of human-created design--rings linked together to make something lightweight and strong. Are you working on any projects this year? I'm going to be building a computer and I'm going to be taking a jewelry-making class (about time!). Let me know in the comments! Happy New Year! Meditate* sorry for the typos. LG keyboard is a nightmare. Yeah it's bizarre how some readings are consistent with each other. And advice is always good even if it's in the form of a card. Tarot is fun, even if you don't believe in divination! I'll be working on improving my sewing skills and, hopefully, making some unique clothes and accessories for Wave Gotik Treffen 2017. I always tell my self I'm going to finally learn to knit but never do. I'm sure you'll get farther than me! That cards freaks me out, though all decks aside from the Rider Waite do. I like your interpretation of the card, I could use some rationality and shrewdness. Haha we'll see what the instructor assigns. It might be awesome stuff or it might be a bead necklace (I HOPE NOT). You've got such responsible goals--good luck!